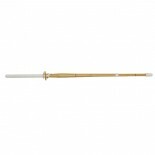 High quality shinai for instructors and masters. 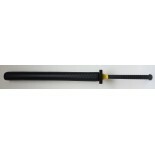 Size 39 (46.5") ..
Sponge sword for training. Sizes: S (28"), M (34"), L (40") ..
For training purposes. Sizes: S (31"), M (35"), L(40") .. Practice all your sword techniques with our traditional bamboo sword. Designed for balance and reliability. This bamboo sword features a leather covered handle & tip, and two piece hand guard. Size Chart: 21, 22, 26, 28, 30, 32, 34, 36, 37, 38, 39 ..
19” (25" OVERALL) replica shinai .. Holds up to four Shinais without Tsuba ..